So, another 6 weeks of winter according to Punxsutawney Phil, huh? I was through with winter about a week ago. Cabin fever settling in on us. I dug through old pictures and found activities Kaye and I did last winter to beat the stuck-at-home blahs. It was nostalgic to look at pictures of Kaye from last winter. She was so little and cute. And what do you know, some of it has to do with reusing household items. Kid friendly, eco friendly. We had a ton of diaper boxes lying around. 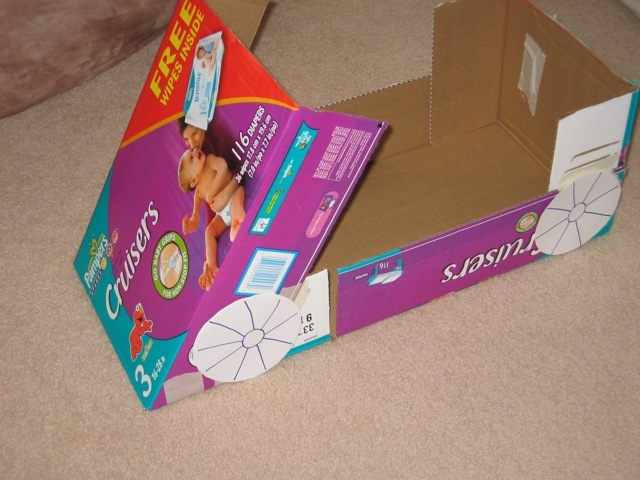 So Kaye and I got a little creative and made a box car using packing tape and paper plates as wheels and steering wheel. Then she sat in it while I pushed her around the house racing in her car. 2. Color your own fort. 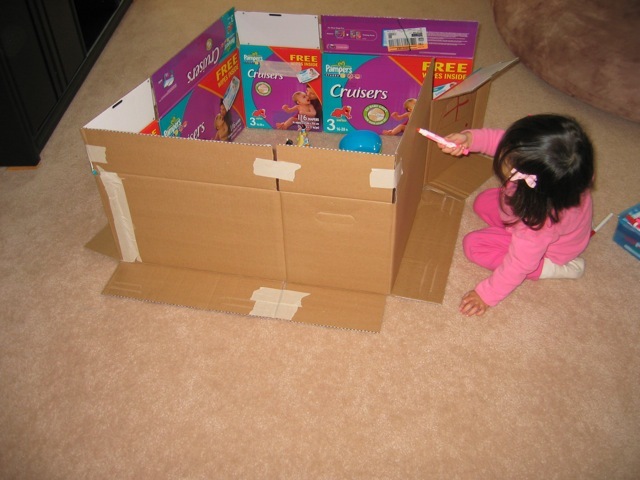 I taped a few diaper boxes together to make a little fort for Kaye to color and draw. She called it her princess castle. 3. 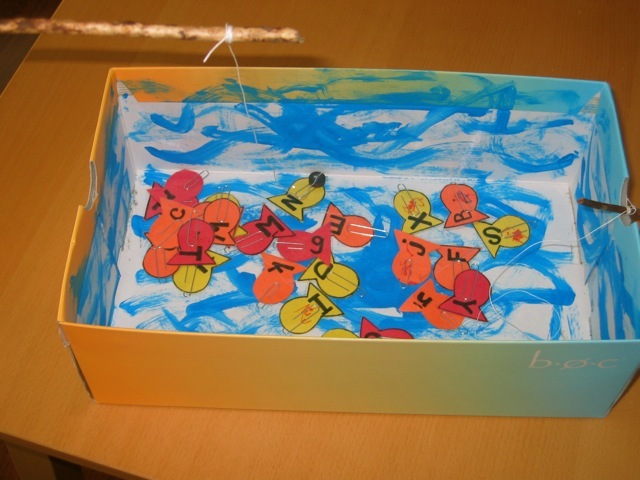 Make a shoebox alphabet fishing game. Kaye helped me paint the inside of the shoe box with blue paint to make the water look. I made a fish pattern, traced it 26 times. Had Kaye color and decorate the fish. Then I wrote each letter of the alphabet on each fish. Cut out. Put a metal paper clip on each fish. Then found a couple sticks outside. Tied a string to it as the fishing line. Finally, glued a small magnet to the end of the dangling line. 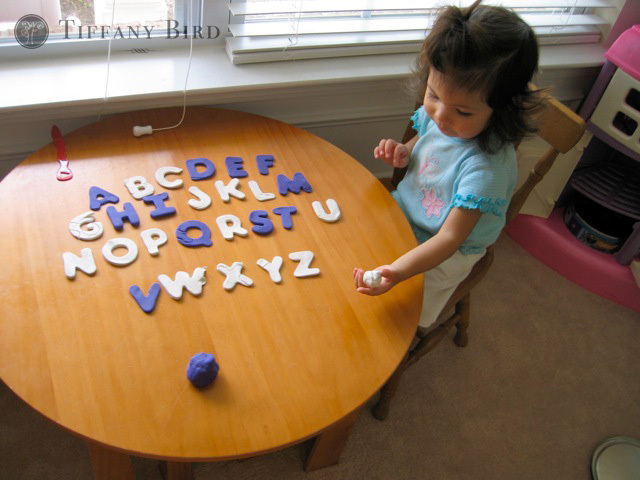 It helped teach her the alphabet. This was a game Kaye played at my parents’ house. 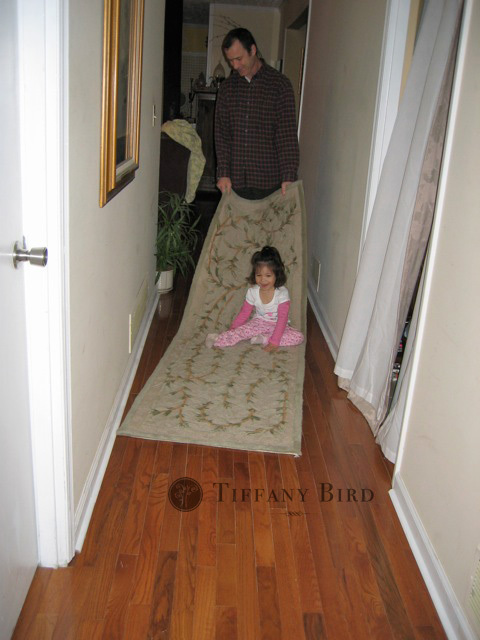 Kaye hopped on a rug, held on to dear life and my dad pulled on the other end of the rug. They went all over the house like that. She laughed so hard. 5. Cookie cutter and wearable Play Dough. 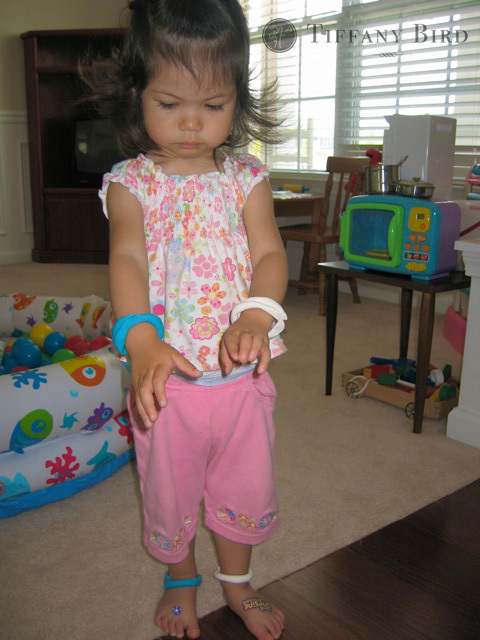 Make bracelets, anklets or use cookie cutters to cut fun shapes. Your kids will love me for this. You will hate me for this. We had a small inflatable pool and filled it with balls. I purchased special ball pit balls at Wal-Mart or you can find it at Target, too. I do have to say, I was happy to put the balls away when the little pool popped a year later. I was tired of picking up 300 balls day after day. However, my kids and their friends all loved it. It was by far the most popular toy in our house. And in the summer, you can pack away the balls and fill the pool with water, in your backyard of course. Love the car…we have tons of these boxes laying around too. Great ideas. I’m definately doing the color your own fort. Thanks for some cute ideas! Love your ideas! I think I have the supplies for most of those activities…thanks! Very creative, and cute!! My favorites are the Color Your Own Fort and the Shoe Box Alphabet Fishing Game! How clever are you!! Thanks – I forgot about 3, 5 and 6 – I’ll do all 3 tomorrow! lots of good ideas. we may be snowed in this weekend!